Golem in game: 873 Who? Important notice! Pokemon Golem is a fictional character of humans. Golem is a bipedal tortoise-like Pokémon with plated, green rocks as its shell. Golem grows bigger by shedding its skin once a year. The discarded shell immediately hardens when exposed to air, crumbling away and returning to the soil. 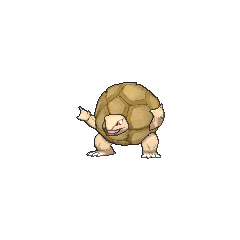 Golem has a head protruding out of the center of the shell, short arms that have three claws, and two legs with five-clawed feet that have four claws in front and one in back. It has red eyes and a flat snout with two pointed teeth in its lower jaw. As shown in the Pocket Monsters Carddass Trading Cards, Golem's shell is hollow. The anime has shown that Golem is able to withdraw its head, arms, and legs into its shell and roll at high speeds. Golem is dangerous when doing this, as it is unable to see and may crash into or run over anything in its path. To prevent it from rolling into the homes of people downhill, grooves are dug into the sides of the mountains to divert the rolling Golem's course. Golem's body is so hard that even dynamite cannot scratch it. Golem is seldom seen in the wild. However, it can be found living in mountainous regions. The Alolan Golem has shorter forearms with two claws and only two claws on its feet. The face has attracted more iron sand, composing the appearance of a mustache, eyebrows and a large black beard. Above its head are two large black rocks jutting out of its body. On the inner edge of these rocks are three golden dots. In-between the two large rocks is a shorter black rock. The Alolan Golem is capable of firing this rock for attacking; if it is not available, it will fire nearby Geodude instead. Golem first appeared in The Bridge Bike Gang, under the ownership of Chopper, who used it against Ash in a battle. It reappeared in a flashback in Charizard Chills. Giovanni's Golem appeared in The Battle of the Badge. Gary used a Golem to battle against Ash's Charizard in Can't Beat the Heat!, but it was defeated. Flint used a Golem against Lola in a feud about what type the Pewter City Gym should focus in A Family That Battles Together Stays Together!. It reappeared in Grating Spaces! where it welcomed Brock home. In Hooked on Onix, Golem and its pre-evolved forms were the loyal subjects of King Onix. Another Golem appeared in An Elite Coverup! under the ownership of Bertha. A wild Golem appeared as a trap in Bucking the Treasure Trend! as a guardian of treasure Buck was looking for. Ash's Gible defeated it easily and sent it rolling back into the cave it appeared from. A Golem was used by a Team Rocket Grunt in Meloetta and the Undersea Temple!. Two Golem also appeared in Genesect and the Legend Awakened battling the Genesect Army at Pokémon Hills. In Showdown at Dark City, it was one of the Pokémon owned by the Trainers at Kas Gym. A Golem belonging to Rudy made a cameo appearance in Misty Meets Her Match. Golem also appeared in The Power of One. A Golem belonging to an unnamed Trainer, appeared in a Hall of Fame photograph in Hello, Pummelo!. A Golem was seen in a dojo in Wired for Battle!. A Golem was one of the Pokémon seen at the Pokémon Swap Meet in Tricks of the Trade. A wild Golem was seen attacking a wounded Houndour in Hour of the Houndour but was driven off by Ash's Chikorita. A fantasized Golem made an appearance in Type Casting. A crook who appeared in The Wayward Wobbuffet had a Golem. 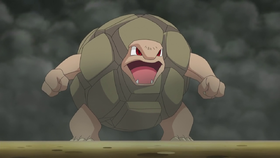 A Golem was one of the Pokémon competing in the Pokémon Sumo Wrestling in Ring Masters. In As Cold as Pryce, a Golem appeared in Pryce's flashback as one of the Pokémon which fought against his Piloswine. A Golem also appeared in Celebi: Voice of the Forest, Pokémon Heroes: Latios & Latias, Destiny Deoxys, Lucario and the Mystery of Mew, Giratina and the Sky Warrior and Challenging a Towering Figure!. A Golem was used by J's client in Pokémon Ranger and the Kidnapped Riolu! Parts 1 and 2. Golem debuted in Drat That Dratini! where a horde of Golem tried to attacke Red and Yellow but they escaped using Red's Aerodactyl. They later appeared again in Long Live the Nidoqueen!? when the people of Viridian City were trying to calm them down. In Sea Sea Seadra several of the wild Golem in Viridian Forest appeared in a flashback of Bill's about the cology of the forest hasn't changed in two years. In Golly, Golem, Giovanni is seen with a Golem as the second Pokémon he sends out against Red. 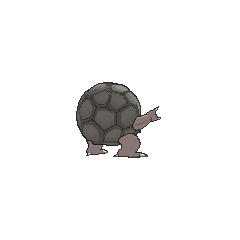 Its best attacks involve its body shattering, allowing it to use Rock Throw. In The Might of... Metapod? !, Yellow's Graveler evolves into Golem during the final battle on Cerise Island. 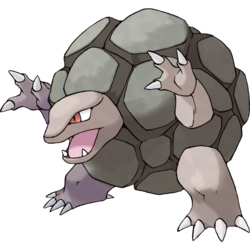 Blaine acknowledges its evolution, as Graveler normally evolve into Golem by trade. 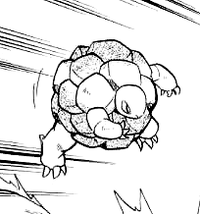 In The Last Battle XIII, a Golem was one of the Pokémon sent to help the fight in Ilex Forest. 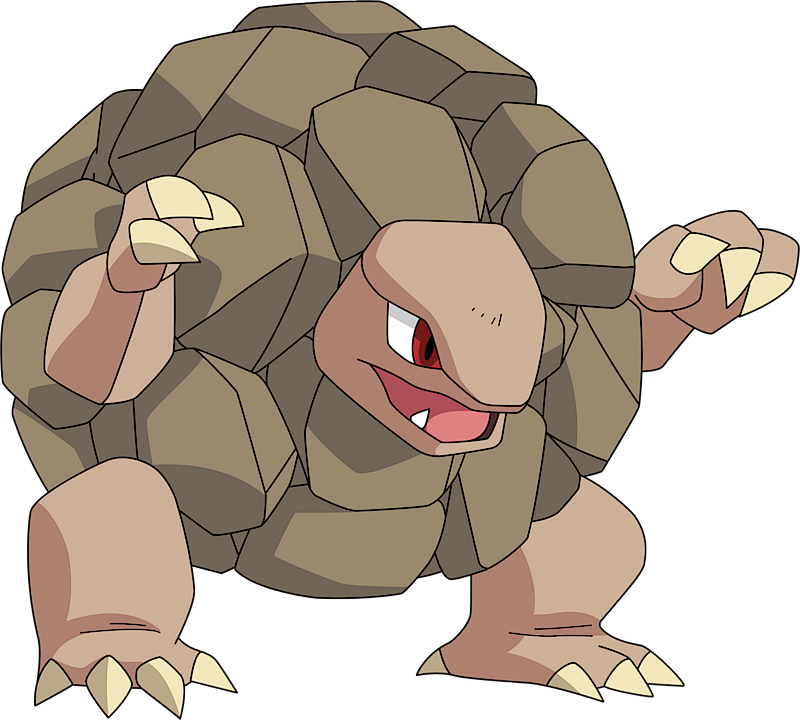 Golem was the second Pokémon that Noland used in the Battle Factory. He managed to defeat Emerald's Pinsir and Linoone but was defeated by Emerald's Sceptile. A Golem appeared in Skirting Around Surskit I as a rental Pokémon that Guile Hideout stole. Giovanni sent out his Golem to prevent Red from interfering with his plans on breeding Mewtwo in Bring Down the Strongest Pokémon!!. Once a year, this Pokémon molts, and its shed shell returns to the soil. This process composes enriched soil, so farmers collect the shells. Making a + shaped match deals more damage than usual. Golem is probably based on a tortoise. Tortoise are believed to hold the world on their backs in many myths, including the Hindu, Chinese and Native American mythologies. Its "shell" may represent the tectonic plates of Earth. Alolan Golem, like its predecessors, seems to have taken on the attributes of magnetite, a subset of iron ore known for its black crystalline appearance in nature. The crystals on its back also may be derived from the railgun.